Inside New Image Art—a small but potent gallery along bustling Santa Monica Boulevard in LA—Michael Vasquez’s paintings are intimidating. 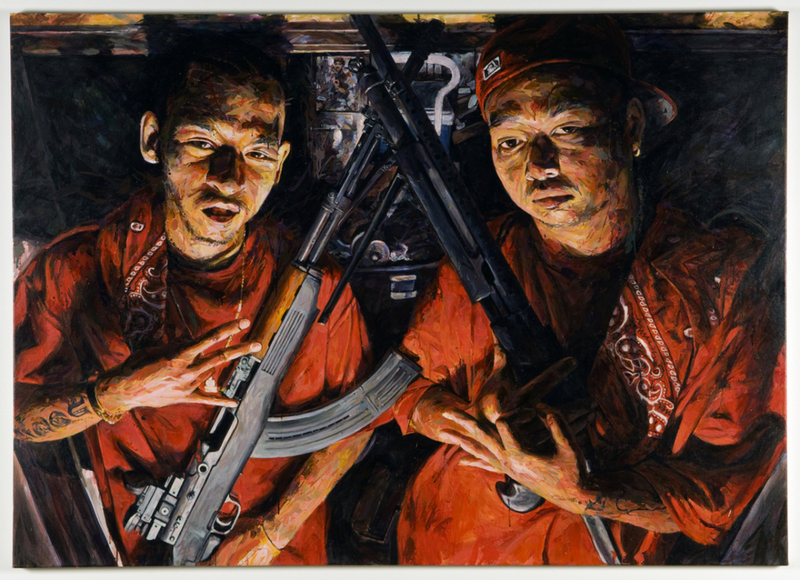 Each features gang members wearing red and brandishing gang signs and guns. But it’s not just their poses that are menacing; it’s their size. 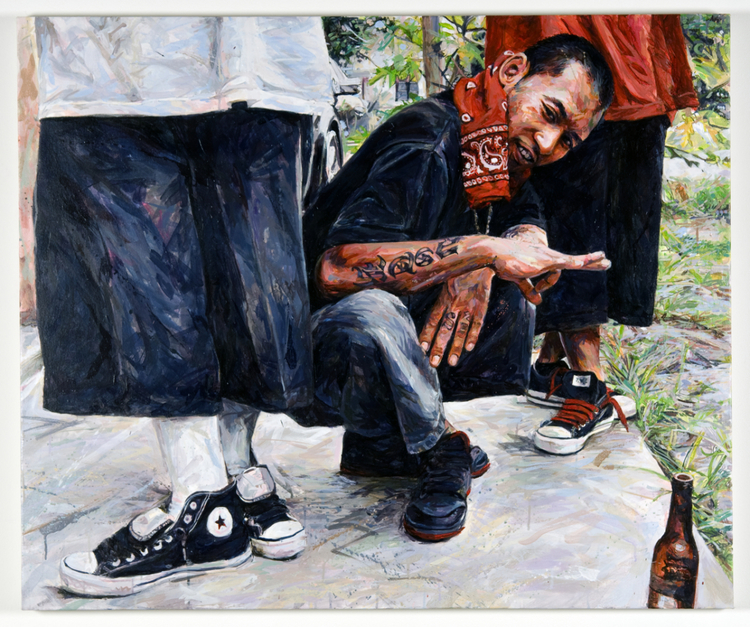 Rendered in larger-than-life detail on canvases around 7-feet tall, Vasquez’s paintings tower over you as the subjects stare you down. Viewers often shift uneasily when looking at these portraits, and that’s exactly what the artist wants. In his current exhibition at New Image Art, which is on view through May 23, Vasquez expands on this concept and shows his work alongside Greg Bojorquez and Patrick Martinez. 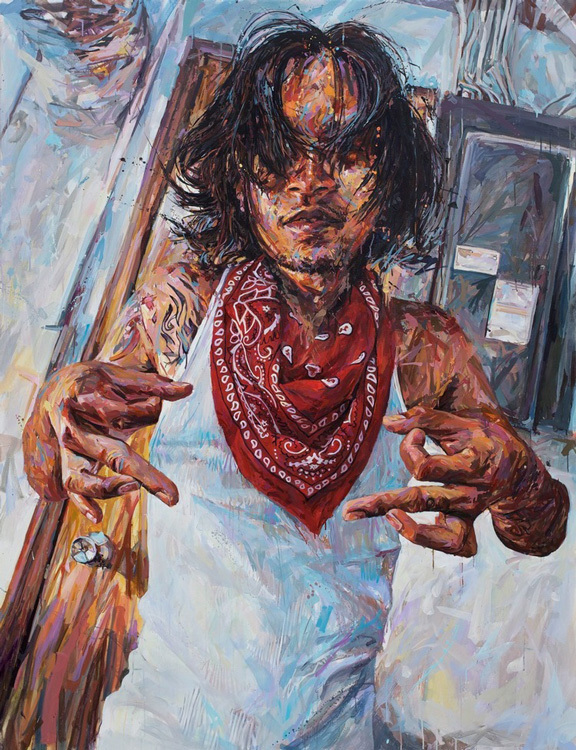 His figurative pieces of gang members are placed next to Bojorquez’s gritty black-and-white photos and Martinez’s still lifes and neon signs—all of which capture the essence of the streets in their own unique ways. Did something happen to make you think being an artist could be a viable career for you? Or did you just always know you would be an artist? I’ve wanted to be some sort of artist for as long as I can remember. But of course, my concept of what that actually meant (to me) changed over the years. It was something that always grew with me. I always associated “art” with my personal interests. Kids like comics, cartoons, video games, etc., so in turn, during my younger years I wanted to be a comic book artist, an animator—it was something that was always evolving. In my late teens, I got into clothing, specifically graphic T-shirts and the like. That all sort of lead to an interest in graphic design. Continuing to follow this thing, I decided to pursue a BFA in Graphic Design at New World School of the Arts in Miami. I think from about the second grade on, I was checking out Lee J. Ames “Draw 50” series books and Stan Lee’s “How To Draw Comics the Marvel Way” on VHS from the public library. I just did a lot of drawing on my own. It was what I liked to do in my spare time. I guess my mother saw how into it I was, and enrolled me in a drawing class at a neighborhood recreation center. Otherwise, at that point, I just had the normal public school art classes. These were your run-of-the-mill elementary school, activity time art classes, but I had some really supportive art teachers that recognized my talent and passion, and pushed me to apply to the local (St. Petersburg, Florida) arts magnet program, Pinellas County Center for the Arts at Gibbs High School. There, things got a little more serious in terms of developing my artistic skills. Knowing I wanted to go to art school for college, but also wanted to stay in Florida, my options were pretty limited—Ringling in Sarasota, or this small, University of Florida-affiliated school in Miami called New World School of the Arts. One of my high school art teachers, Joyce Walker, was originally from Miami and knew quite a bit about the program at New World. She weighed the pros and cons of both schools with me, and in the end it was no brainer. Definitely a pivotal moment in my life, and I thank her for helping me make the right decision. Michael: My time at New World was when my aesthetic really developed. Prior to this point, my main visual influences were from comics/anime, graffiti and gang culture. When I got to New World, I began to be influenced aesthetically by what others directly around me were doing. New World is also home to Miami-Dade County’s arts magnet high school. Both the high school and the college actually share the same facilities (just on different schedules). The high school program is undisputedly one of the best in the country. The hallways are lined with amazing, masterful paintings and drawings done by high schoolers. There seemed to be a connective aesthetic between these works, one that was very painterly, highly saturated, and interested in mark making. There was also an illustrative element in the work that connected me back to the comics and things that I was into as a kid. This attracted me and I wanted to understand the approach. My painting teacher there, Aramis O’Reilly, had this amazing way of breaking it all down verbally that really resonated with me. I sort of took this style and ran with it. I know I’ve definitely developed it and taken it into a direction I like to call my own, but people like Jose Felix Perez, Reinier Gamboa and Chat Travieso, all of whom were still in high school at the time, were definitely inspirations starting out. I like to say that I’m influenced by nouns—people, places, and things—is that a cop out? But seriously, I would say the things that influence me most are people and their lives. The human experience. Some artists make work that is specifically about art or art movements, essentially art about art. I’m not really into that. My work is about life and people’s perspectives and experiences that make them who they are—identity. As far as the nouns that I am most interested in: all people and places, neighborhoods, garages, and clubhouses and things—signs, symbols, identifiers and mentalities of subcultures. You’re most known for large-scale portraits. How important is the scale of the painting to you? Do you feel like it has more impact at that size? Scale is important to me on several different levels. One thing I always try to think about when making work is exactly that: impact. Usually, executing works at a grand scale is an easy way to enhance impact. But beyond that, I generally want the viewer to feel immersed in, or consumed by the work. I want them to have to move their heads around to look at everything, not just their eyes. Most importantly, and in direct reference to the large-scale portraits, I want these works to be aggressive, intimidating, and tower over the viewer. I want to force them to look up to the people in the paintings just as I looked up to these people growing up. I also like the room for opportunity to explore and develop forms of mark making that a grand scale can offer. The grand scale can be humbling, and also brings on a sense of accomplishment when the work is finished. I feel like I just climbed a mountain or something. Who are the people in your paintings? What fascinates or intrigues you about gangs and that lifestyle? Most of the people in my paintings are close friends of mine. People that I grew up with looking up to. I am an only child of a single-parent mother. I didn’t really have a father figure in my life. When I became old enough to start to venture and “hang” out in the neighborhood, I met and formed friendships with kids that were in or associated with a neighborhood street gang. Although much of this was realized in retrospect and through actually making the work, I think it was my upbringing that attracted me to this type of group and structure. The gang idealistically embodied the concept of an extended family with its own set of values, all the while projecting a certain level of toughness and masculinity. These seemed to be the things I was missing, or maybe even unknowingly searching for in my definitive and naive early years. Tell me about your exhibition at New Image Art with Patrick Martinez and Greg Bojorquez, both of whom I’ve known for years. How did you meet them? Why do you think your works fit together? What can people expect to see from you in this show? Although I was already familiar with their work, I met them both through this show. Marsea Goldberg and Edith MonDragon had this idea for a three-man group show that highlighted the grit and aesthetic of street lifestyles and mentalities. I think much of our work addresses just that. 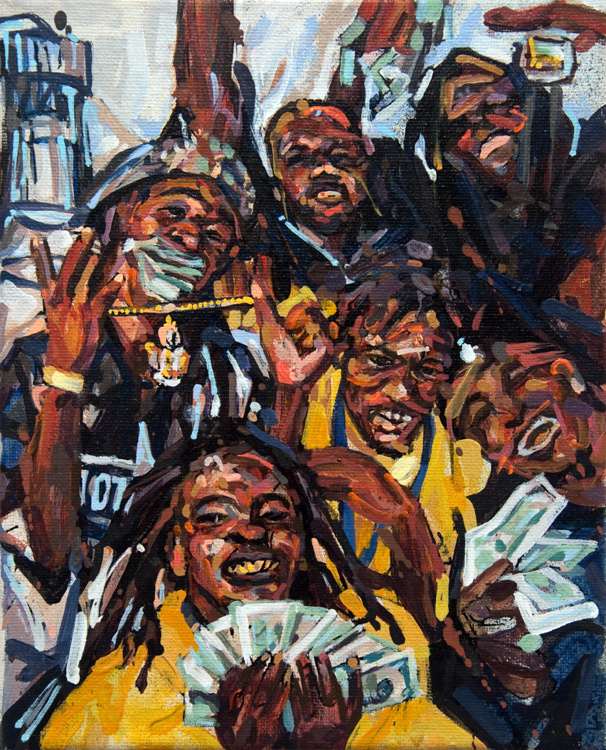 Marsea and Edith selected a couple of my toughest paintings from my personal collection (yes, I sometimes collect my own work) and I also opted to create an entirely new work, “Neighborhood Legends – Control, Power,” which to me is the highlight of my place in this show. 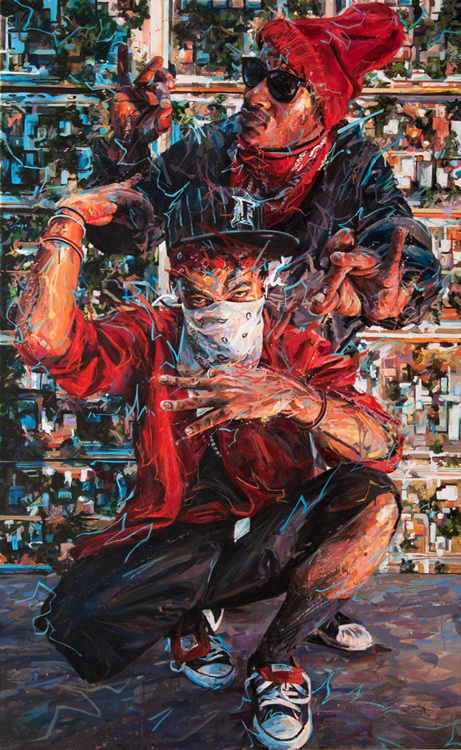 In this work, two figures flash gang signs and intimidate proudly in front of a backdrop of aerial images of their neighborhood pulled from Google Maps satellite view. This aerial perspective underscores the idea of the neighborhood as territory, objectifying it and presenting it at a scale that makes it seemingly easy to control. The brushwork that accentuates the figures and their gestures represent a sort of energy or power, existing in space and belonging to neither the figures nor the background, yet somehow informing them both. I like your connection between the three dots and the fact that there are three artists in the show. I don’t think I had realized that yet. Well, originally the working title for the show was “La Vida Loca.” I liked the idea and the reference and all, but I just couldn’t get Ricky Martin’s smash hit out of mind. Maybe it’s just the Miami in me, but obviously that wasn’t really the vibe we were going for. When Edith emailed us about thoughts on the title, the slight variation of “This Crazy Life” came to mind. I suggested it and I guess Patrick and Greg were cool with it so we ended up rolling that way. Work hard. Seriously, work hard. You have to know that no one can work harder than you, and that no one could ever care more than you do. It’s not easy to make the sacrifices others aren’t willing to make. But you make them, and sometimes that’s all it takes. You can catch the This Crazy Life group show with featured works from Gregory Bojorquez, Patrick Martinez, and Michael Vasquez from now until May 23 at New Image Art.